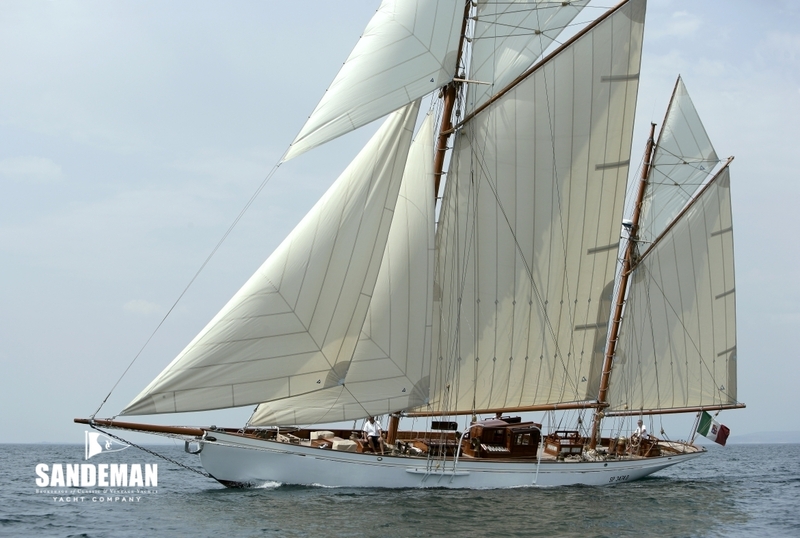 The fine Gaff Ketch JAVELIN was designed in 1896 and launched in 1897 to be included in the 1898/99 edition of Lloyd's Register of Yachts. 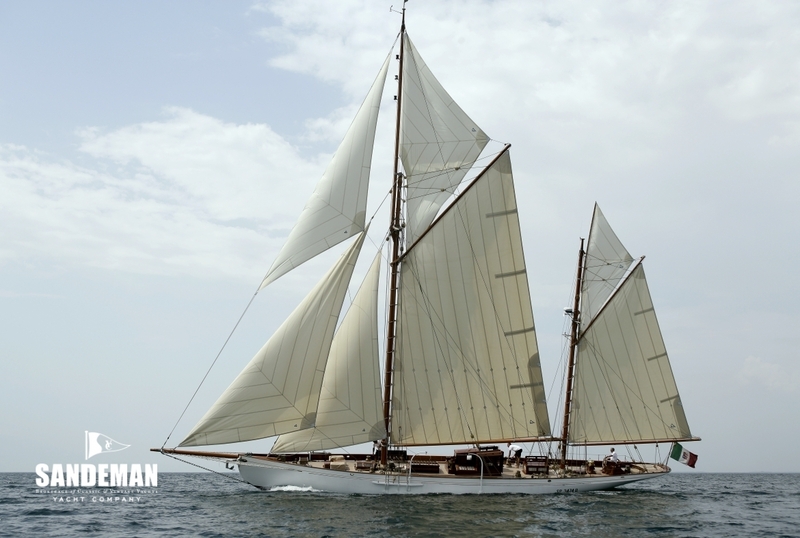 With sails made by Ratsey and Lapthorne JAVELIN took the second prize in the race from Cowes to Weymouth at the turn of the century. Arthur Edward Payne, succeeded his father Alfred and elder brother John as owner of the eponymous shipyard at Northam, Southampton. 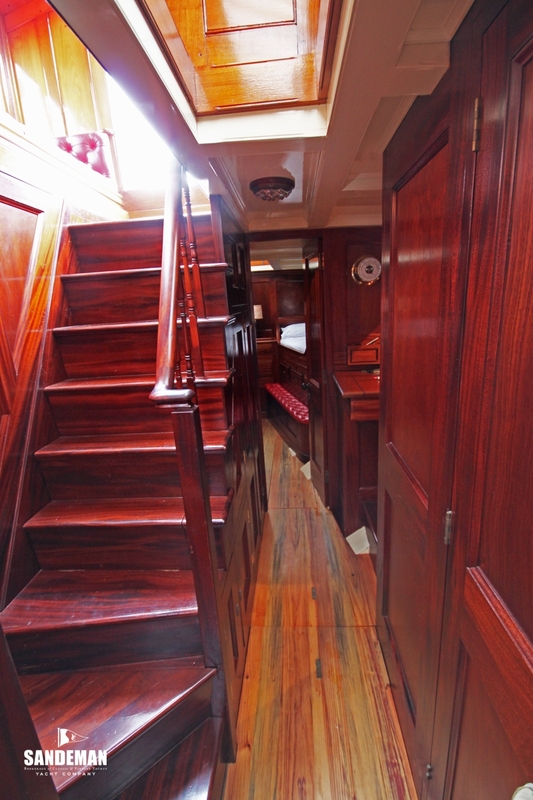 From the early years of the nineteenth century, Paynes had designed and built fast boats - approaching the zenith of their fortunes in the last quarter of it. 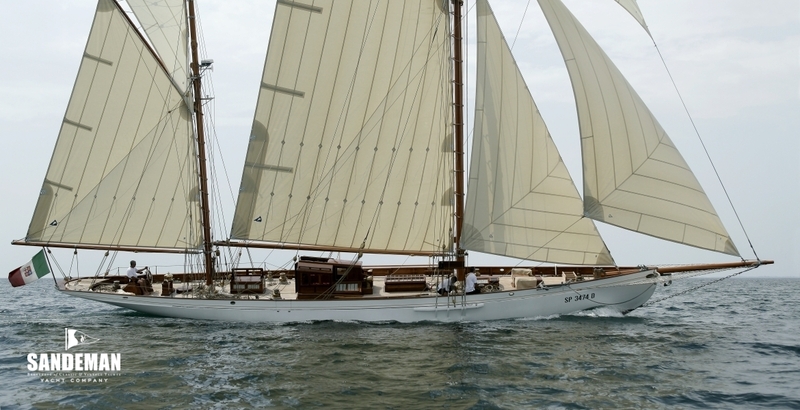 Contemporary with JAVELIN, were the 65 ft linear racer TUTTY and the smaller cutter GLORIA; both were successful race winners to be followed by several more yachts mainly 52 footers under the Linear Race Rule. The skipper of another contemporary the 62 ft comfortable yet speedy cruiser BANBA declared he’d back her against any vessel in a gale – and she could win her place in handicap racing. 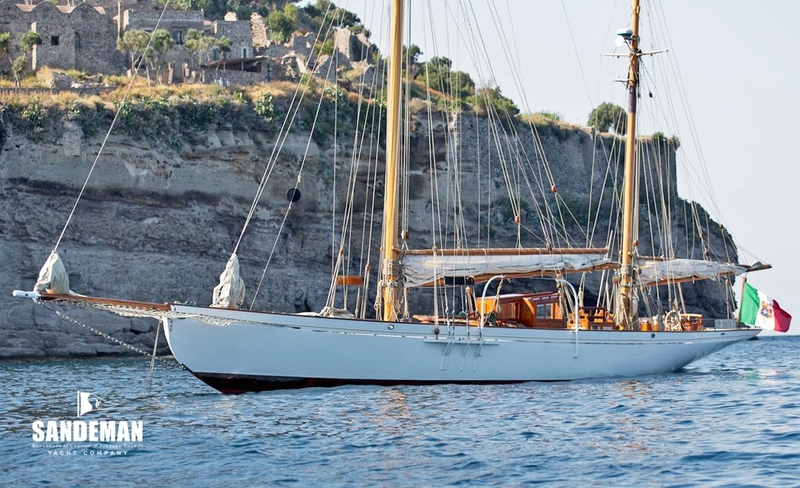 Like JAVELIN Some of his boats famous then are still operational today and include WILLOW WREN a gaff ketch of 1886 a fast pilot cutter built for Lord Philip Patmore for patrolling and hunting down smugglers in the service of the Queen. 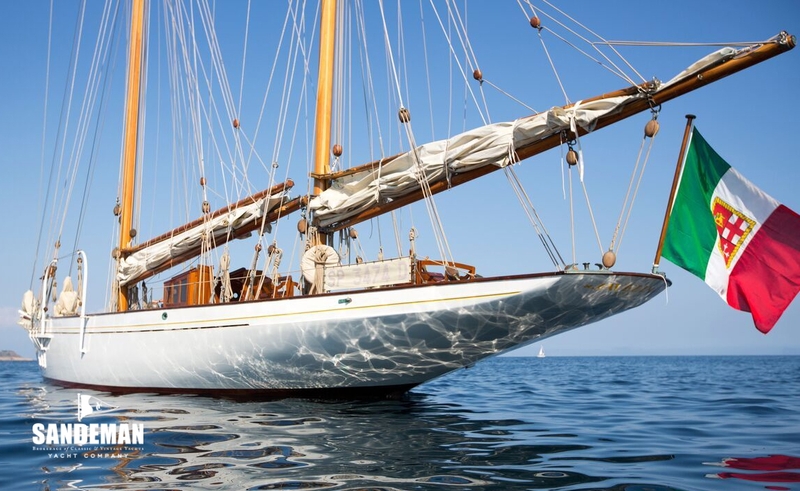 Another is CARIAD a gaff ketch c 100 ft built for Lord Dunraven in 1896 that in 1898 took part in the Vasco de Gama regatta from Lisbon to India and won it. 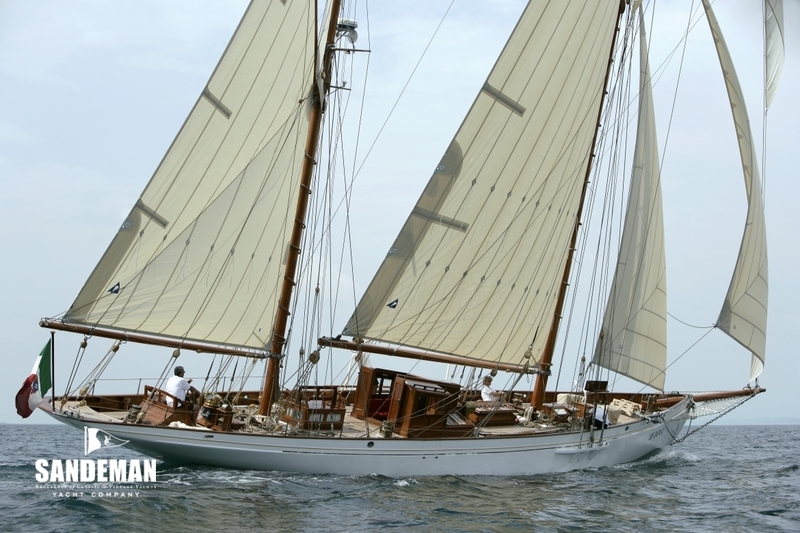 ARTEMIS a splendid gaff yawl was designed more along the lines of boats more familiar to us today and proved a great winner of regattas especially in Germany. While Payne was an excellent designer, he was evidently not so successful in business. His shipyard which, in 1890 had become Summers & Payne, was in the early 1900s, taken over again, together with all its workers by Camper & Nicholson and the identity lost. At the turn of the 19th 20th centuries JAVELIN’s registered owner was: E R T Croxall of Manor Aldridge, Staffordshire who also owned the 9 ton SHULAH. His club memberships were recorded with the Royal Corinthian, Cruising Club, Royal Dorset, Oxford University Sailing Club (VC) and from 1898 the Royal Portsmouth, Corinthian and Royal Southern. 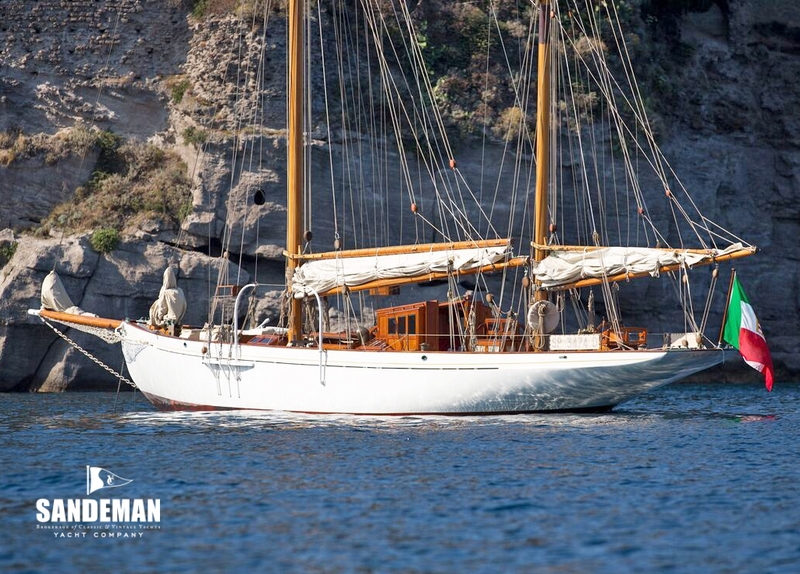 In 1950 again; the boat moved to the Mediterranean It’s known she was registered at the Real Club Nautico of Barcelona but not the name of her owner – and there were links apparently with the Spanish Royal family but these are unsubstantiated. 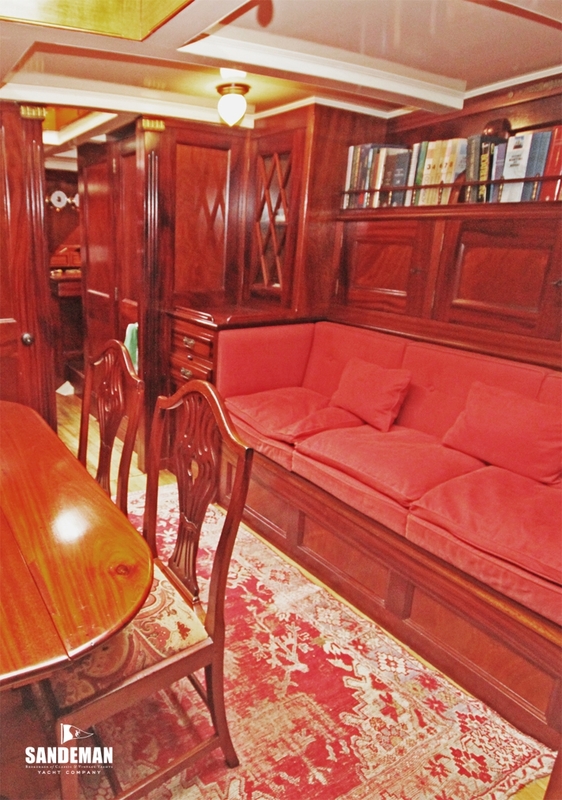 In his book “Down Below – Aboard the World’s Classic Yachts” Matthew Walker refers to her ownerships – in 1971 in Barcelona and sometime thereafter by Emyr W Davies, whose custodianship was to good effect in preserving her and historic artifacts at the time. 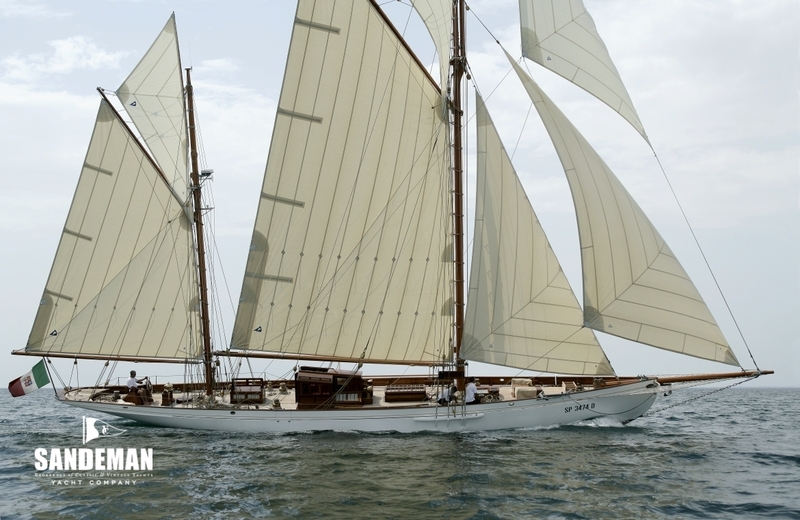 Much later in 2002, she was found totally abandoned in the port of Soto Grande near Gibraltar, her name having been changed to JAVELIN OF NORTHAM. 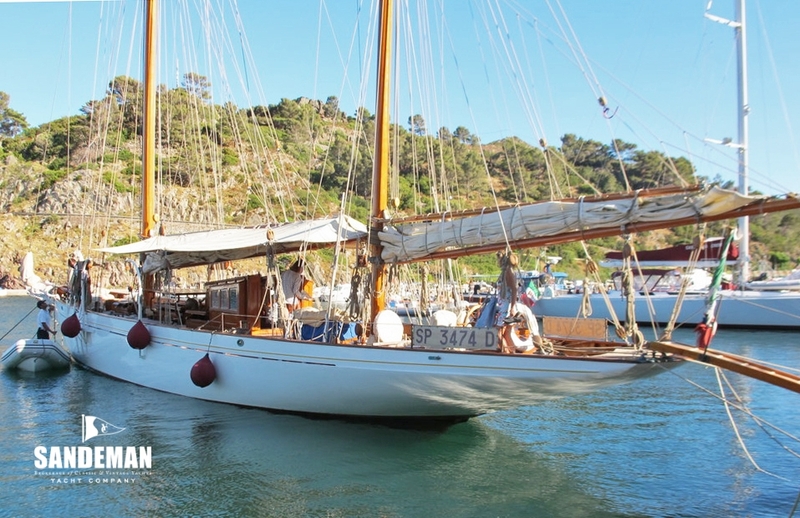 It was there that Hervé Decker in charge of the Sailing Channel for Spain and Morocco – the European satellite television station specialising in the world of sailing – saw her and fell in love with her. 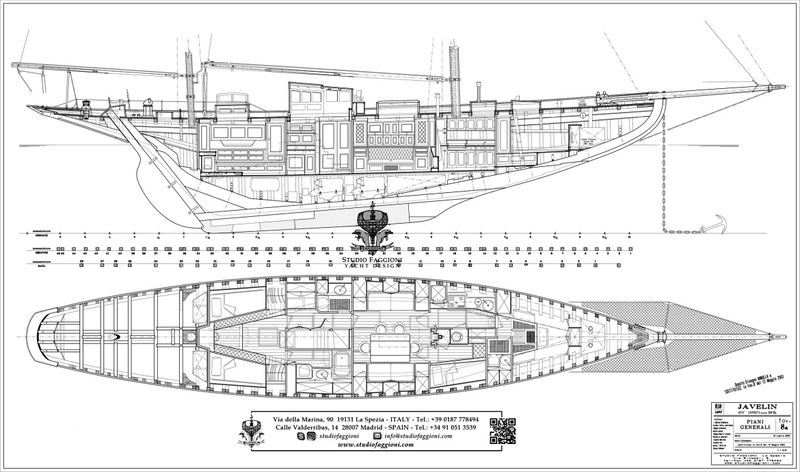 Mr Decker realised immediately the boat was of immense interest and that her resurrection could be a great story to document and to present to enthusiasts. First however he needed to find a person capable of understanding her hidden value and prepared to finance the restoration. 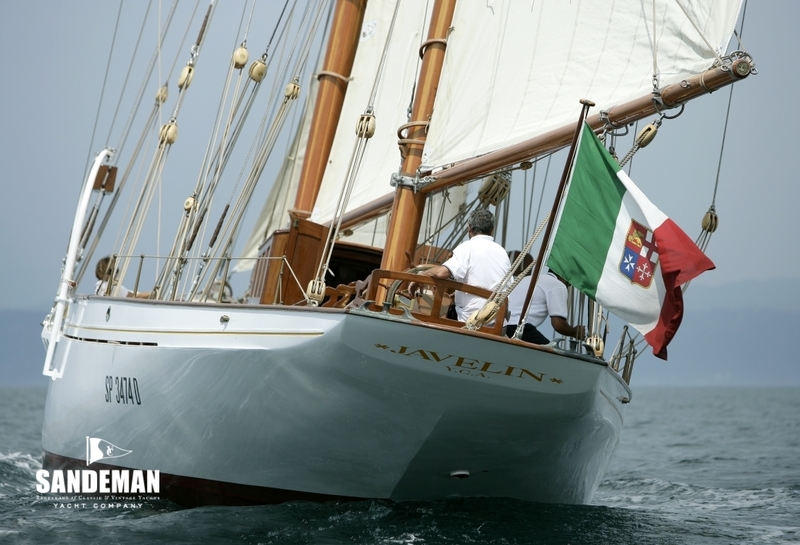 After several months he identified and contacted an Italian entrepreneur, also a fine sailor and a great enthusiast for vintage boats, who immediately perceived the importance of JAVELIN. 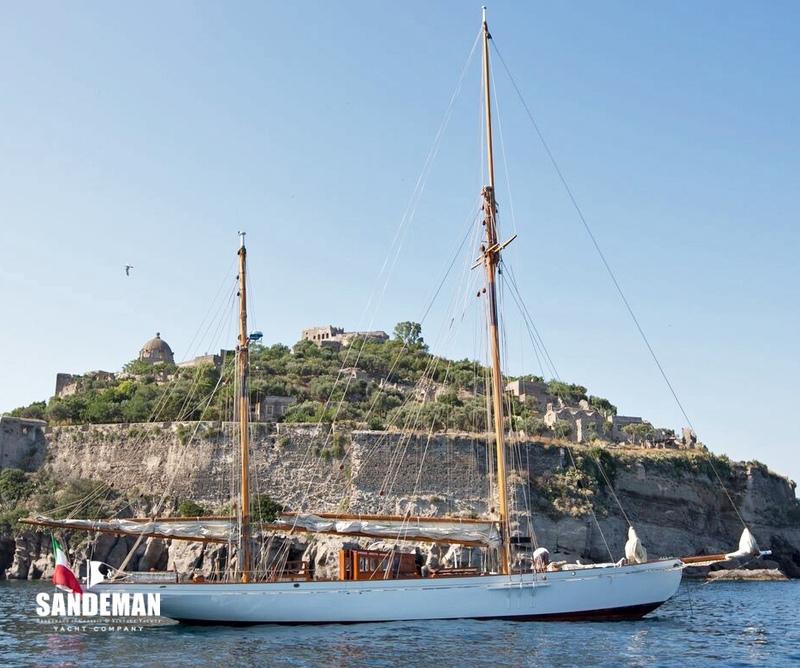 Within a few months she was purchased and after careful consideration the decision made to undertake most of the restoration in Spain so the boat would be spared the stress of transportation elsewhere. It was there where it had been for more than a century; a silver shilling, coined in 1884 was wedged into the bottom of the oak step of the mainmast. As protection for warding off bad luck, it had worked well if, at the start of the new century, it saw light again before returning once more to its home under the new mast. 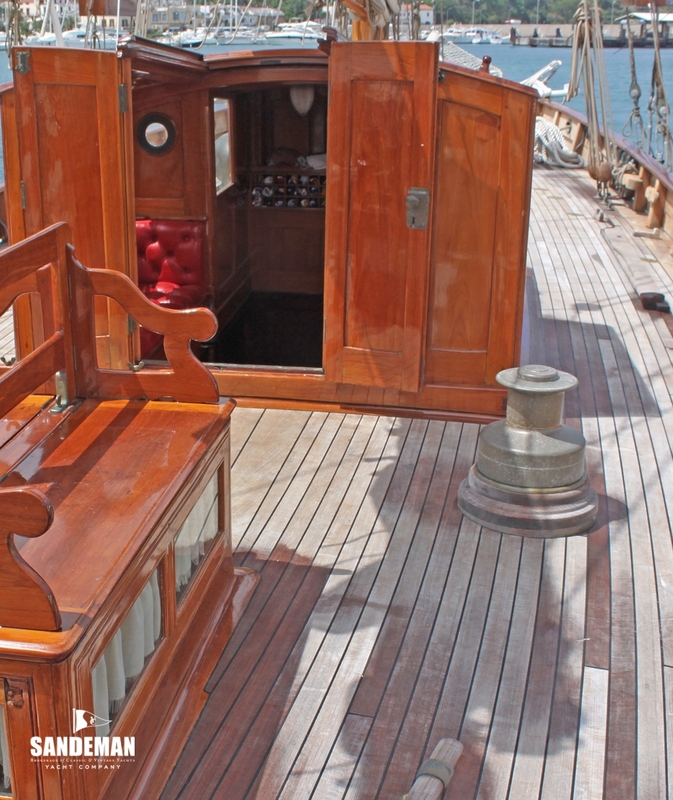 To restore a boat means bringing it back to a new life without changing its soul or character. All the work on JAVELIN has been based on this principle and any necessity to make concessions to modern times kept as discrete as possible. 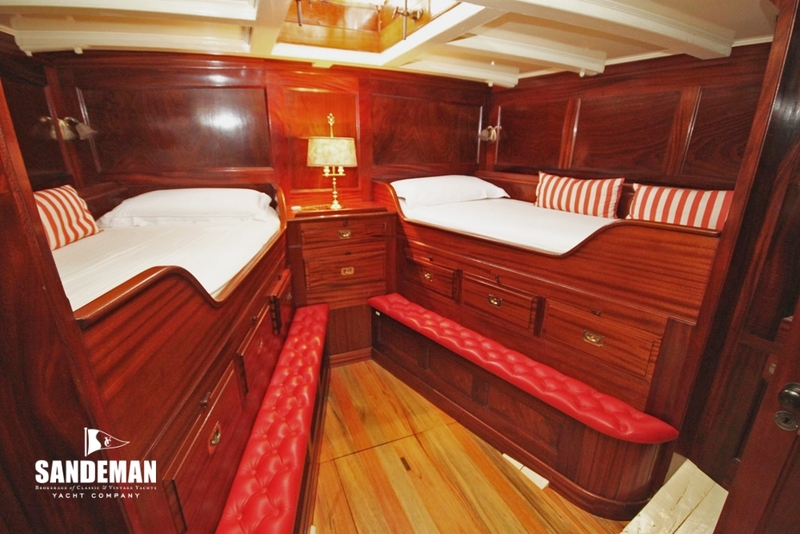 Original features such as the lady's bath in the master cabin and a fireplace in the saloon contribute to JAVELIN’s period credentials. 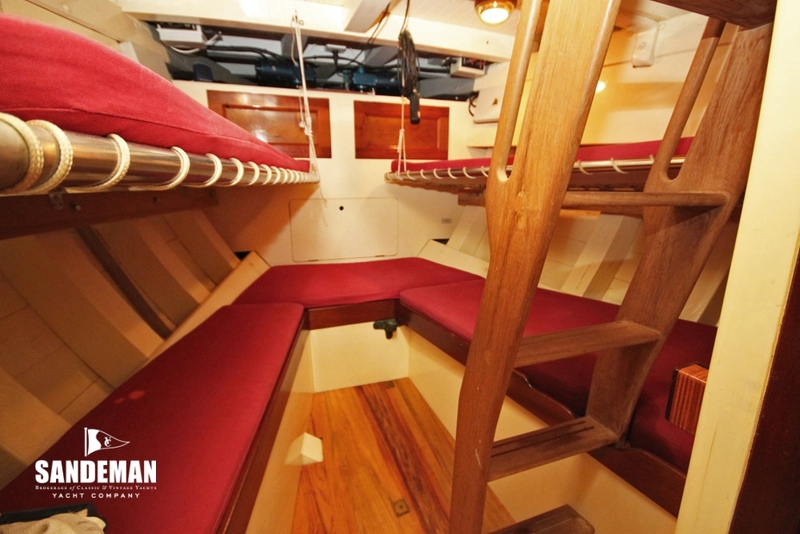 The dog house, the various skylights, hatches and all deck fittings were equally in perfect condition. What was in need of a great deal of work was the structure. 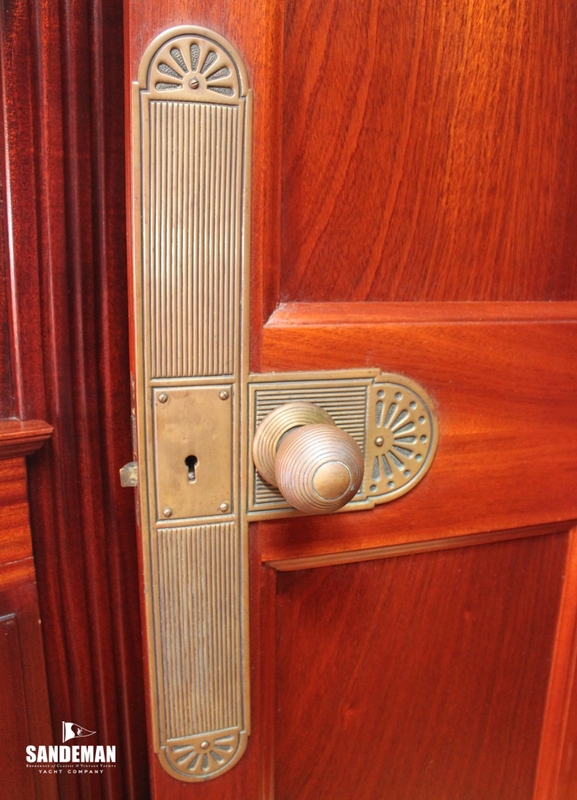 This had suffered seriously from the action of the numerous iron fittings that over the hundred years, had led to the deterioration of the oak frames. It was therefore decided to take drastic action and replace these almost in their entirety with frames in chestnut oak from Galicia and the beams in white pine. 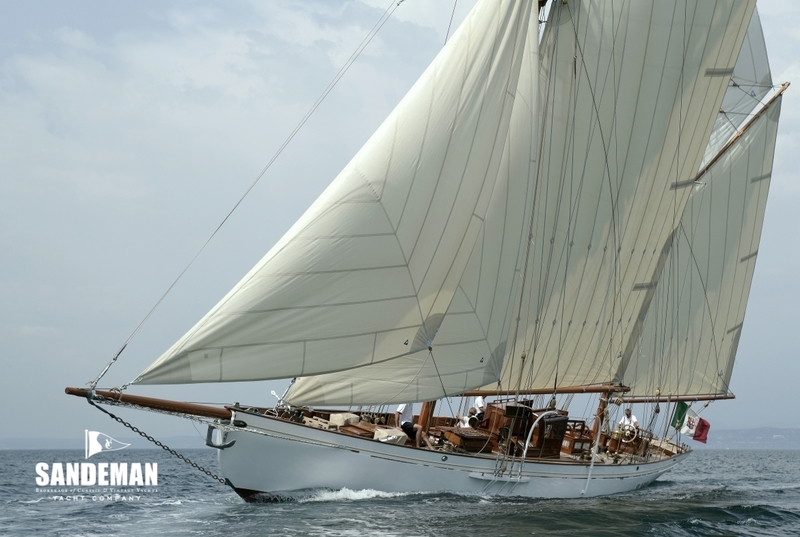 The deck was replaced in Burma teak and the spars of Douglas fir certified clear quality to Spars & Masts standard. 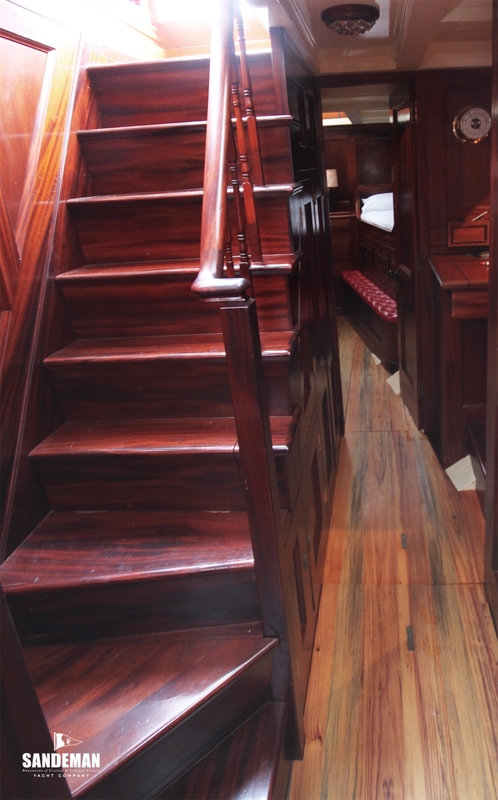 For the fittings; all those existing pieces considered to have been original were preserved and re-utilised: companionway, doors, map table, locks, lamps, mouldings and the like whilst, for the newly constructed fittings, Honduras mahogany was used and its origin was certified as environmentally friendly by the forestry authorities. Accepting that at launch, she was engineless, installation two engines and two screws with hydraulic transmission give the boat both speed and manoeuvrability. 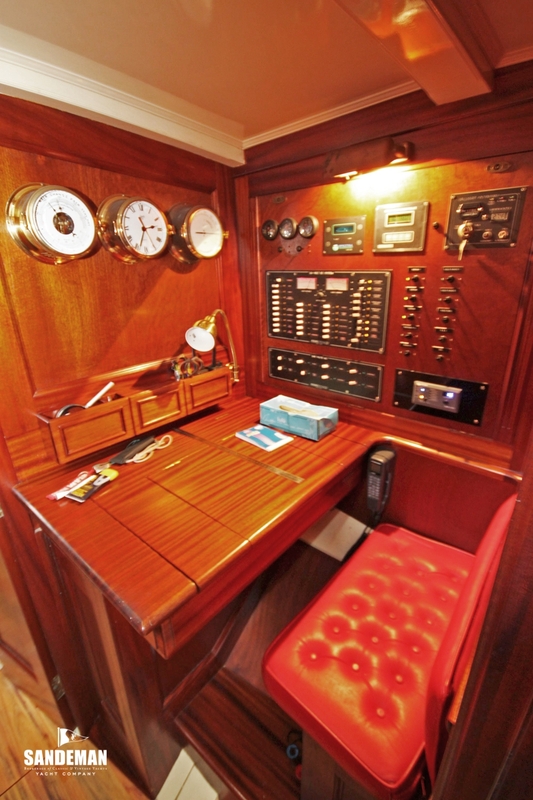 The installation has deliberately not interfered in the slightest with the interior layout of the boat which remains as original as is the helm. Similarly the electronics, an essential requirement nowadays are pretty well invisible except when actually in use. 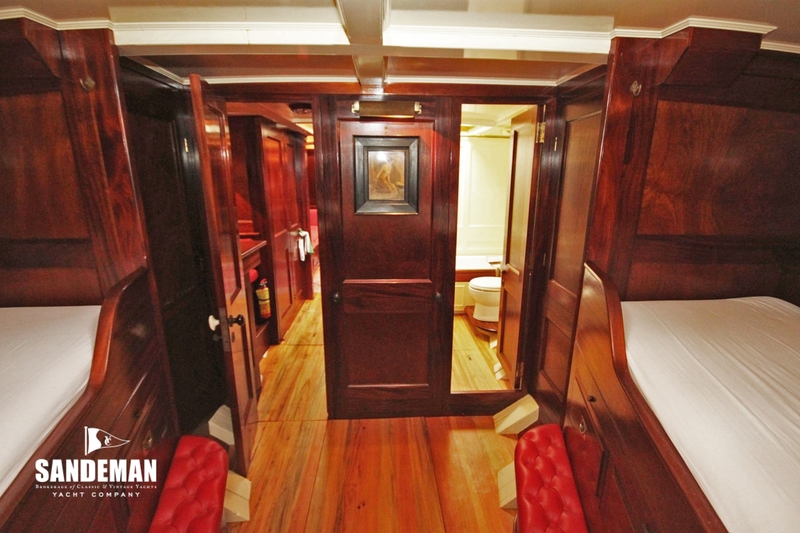 While there are modern conveniences in the galley and the bathrooms, the restorers did not want to relinquish the Victorian style – so for example the master bathroom still boasts a bath tub, very much the status symbol for a lady of that era. 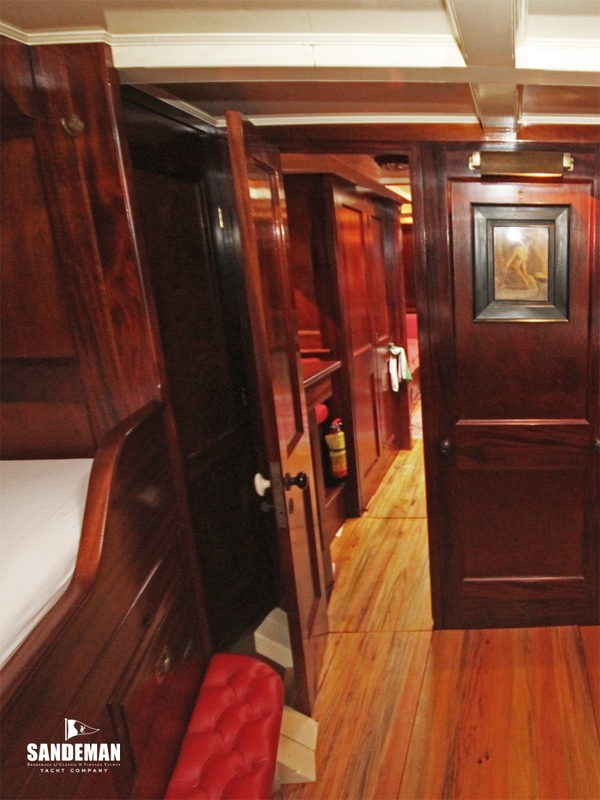 The saloon, with many period fittings, is further enhanced by the reintroduction of the fireplace; fitted when the boat was built but lost in later years. In Beken’s photo of the period the chimney pot is clearly visible on the deck.